Author(s): Senem Sanlı, Nurullah Sanlı, Faculty of Engineering, Usak University, 64100, Usak, Turkey. Craig Lunte. Introduction: In this study, two simple, accurate, precise and fully validated analytical methods for the simultaneous determination of valganciclovir and lamivudine in dosage forms have been developed. Methods: For RPLC method, separation was performed on an XTerra RP-18 column (250mm×4.60mm ID×5_m) at 30°C with the mobile phase acetonitrile : water 10 : 90 (v/v) adjusted to pH 5 with 20 mM NaH2PO4. The second method depends on capillary electrophoretic determination of these two compounds. 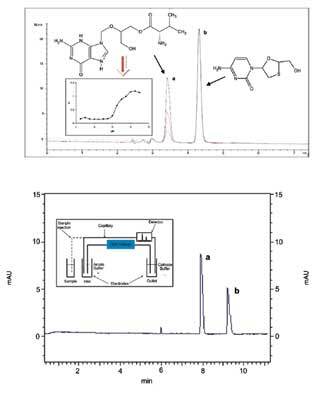 At room temperature, these compounds could be well separated within 8 min without using organic modifier in a 55 cm length capillary at a separation voltage of 26 kV with 20 mM NaH2PO4-H3PO4 (pH 2.5). These methods allow a number of cost and time saving benefits. The described methods can be readily utilized for analysis of pharmaceutical formulations. The methods have been applied, without any interference from excipients, for the simultaneous determination of these compounds in tablets. There was no significant difference between the performance of the proposed methods regarding the mean values and standard deviations. Conclusion: For two compounds, pKa values were determined using the dependence of the retention factor on the pH of the mobile phase .The effect of the mobile phase composition on the ionization constant was studied by measuring the pKa at different acetonitiril–water mixtures, ranging between 5 and 15% (v/v), using RPLC method. Keywords: Valganciclovir, lamivudine, validation, RPLC, capillary electrophoresis. Affiliation:Faculty of Engineering, Usak University, 64100, Usak, Turkey. Keywords:Valganciclovir, lamivudine, validation, RPLC, capillary electrophoresis.